The information about this bug in Launchpad is automatically pulled daily from the remote bug. This information was last pulled 33 minutes ago. Since update to Cosmic, I see that bold fonts in Java have broken rendering. See attached 400% scaled PNG for illustration. 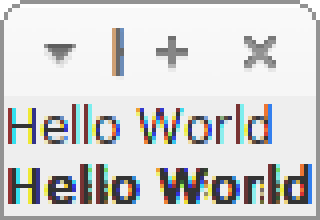 The 'r' in bold rendering of "Hello World" shows basically a vertical line from the end of the hook end. I am not entirely sure this is freetype issue but some sources (https://github.com/adobe/brackets/issues/14290) suggest there is a bug in the 2.8.1 version that Cosmic seems to install (libfreetype6/cosmic,now 2.8.1-2ubuntu2 amd64 [installed]). Here is a small test application that shows the issue. The testcase needs the “package test;” in the first line removed / commented-out, then it works. This works in 11.0.1+13-2 on Debian sid, as a new data point. * Drop the jdk-freetypeScaler-crash patch. Closes: #905718. * Sync packages with 11~28-3." I confirm that on my Debian sid+experimental system, fonts look OK in openjdk-11. and only found files from /var/cache/fontconfig/ and no actual font files. Other applications have files from /usr/share/fonts/, but not the JRE. Stealing libfreetype6 2.9.1-3 from Debian and installing it make the rendering passable again. Not subjectively 100% as good as Java 8, but fine enough to get used to. I build the jdk branch and found the issue fixed. I also rebuild the ubuntu package with the above mentioned patch included (only the change in freetypeScaler.c, not the new test) and also found, that this fixes my problem. I don't know the plans for java in ubuntu regarding LTS releases and patch backports, but it would be great if you could include the patch. For the record: I did not write that patch, it is the referenced changeset above, modified to be applied while building the ubuntu package. The attachment "font-fix.diff" seems to be a patch. If it isn't, please remove the "patch" flag from the attachment, remove the "patch" tag, and if you are a member of the ~ubuntu-reviewers, unsubscribe the team. fixed in 11.0.2 in disco. > fixed in 11.0.2 in disco. Accepted openjdk-lts into bionic-proposed. The package will build now and be available at https://launchpad.net/ubuntu/+source/openjdk-lts/11.0.2+9-3ubuntu1~18.04.1 in a few hours, and then in the -proposed repository. I have filed this defect against 18.10, not 18.04 though. Bionic fix is useless for me. Thank you for taking the time to verify this stable release fix. We have noticed that you have used the verification-done tag for marking the bug as verified and would like to point out that due to a recent change in SRU bug verification policy fixes now have to be marked with per-release tags (i.e. verification-done-$RELEASE). Please remove the verification-done tag and add one for the release you have tested the package in. Thank you!